Draw him, colour him, dress up as him—I think every kid remembers the first superhero he created. Not that first ideas are always the best. My concept, at age eight or nine, was awful. The character was wealthy Reginald Van Buren. His sidekick was his muscular manservant—whose name I can’t recall—and very British. Their alter egos: Black Butterfly and Brown Derby. These dreams of a grade-school comics creator were derivative, built on conventions of the genre: wealthy hero, faithful and able sidekick, fateful adventure, mysterious powers. The ideas behind the characters needed converting or embellishing. Where the characters had true merit was in my aspirations: all the lead heroes mentioned above were black, with traits and speech drawn from people I knew, people who looked, sounded and acted like me in Montreal’s West Indian community, my immediate community at the time. Throughout high school and university, this trend/inclination/artistic choice (I’m not sure what to call it since I wasn’t conscious of it back then) continued. My character Bobcat, leader of a Canadian superhero team, was black. Safeguard of the North—my answer to Captain Canuck and Guardian and Northguard—was black; or at least not as white as the great frozen country he represented might expect him to be. Despite buying comics where the main heroes were usually white—or maybe because of this—it never occurred to me how unusual my choice was. I was a black boy creating black heroes. What was so unusual about that? Seeing myself in them was about making reality more real, more complex and complete. But it was somewhat unusual, and a decision I could not take for granted when writing my novel And Sometimes They Fly about a trio of would-be heroes from the Caribbean whose time it is to rise up. For nearly twenty years, I’ve taught research methods and research-paper writing to BFA Graphic Design and Studio Art students at Barbados Community College. A number of the students are into graphic novels. They read them and write them and draw them in their spare time or as part of their major and minor graduation exhibition projects. According to current statistics, approximately ninety percent of Barbados’ population is of African descent, with the rest being of mixed European and Asian ancestry. My students’ environment is, therefore, visibly black. When these students enter the programme, however, many of them show work that is heavily inflected by Japanese anime and manga; their panels are not populated by characters who look like them or the people they are most likely to meet in their neighbourhood. One of my students shared a story in class about creating a character in high school that was a protector of Barbados. The hero’s familiar was a water dragon. When one of his teachers asked him why his hero wasn’t black, or why the character didn’t reflect his creator’s own culture in other ways, he told her these thoughts had not occurred to him. At all. Another student in the class, one of my best and brightest and also an aspiring graphic novelist, said he could never find the epic in Caribbean stories, that spark to fire great works. The cartoons from Japan he and his classmates watched, the comics from that country they read, seemed more resonant than anything their history or reality might make possible. The crime—let’s call it that—wasn’t that too many of my students couldn’t see the epic in their own people’s stories, which included vast kingdoms and empires, ancient knowledge and fables, the middle passage, slavery, colonialism, Independence movements, post-colonialism, neo-colonialism, indigenous mythology and folklore. The crime was—is—that they had never thought to fan the fire themselves: to create what was missing, to suggest what was possible, to write the stories about their own people that they wanted to read. Part of the problem was the social engineering they had undergone as Barbadians, which I examine in And Sometimes They Fly. My students and many Barbadians like them were raised to believe other people’s heroes saved the world, not their own. Who would these worthy men and women be anyway? Their politicians didn’t call in the good guys when the going got tough; they considered themselves the good guys, and had put commemorative plaques on buildings and open spaces all around the island that essentially said so. Coupled with a decline in oral storytelling not redressed by a more active publishing industry, this belief in the outside hero has spelt the demise of the fantastic in much of Barbadian Literature. Not entirely, of course. Barbadians—and their stories—are more tenacious than my students might think: more entertaining, more epic, more idealistic, and hence more enduring. Try, as Bajan or world critic, to dismiss writers like Kamau Brathwaite, Geoffrey Drayton, Paule Marshall, and Timonthy Callender. You’d be missing out if you weren’t aware of others like Glenville Lovell, Ronald A. Williams, Karen Lord, and Matthew Clarke. It takes cultural consciousness to resist the drag of negative foreign incursion; the kind of cultural consciousness that can conceive of anything, including a black Superman. But not a black Superman. Despite successful renderings of, say, a black Green Lantern or a Latino Spiderman, I never wanted coloured analogues of my favourite heroes. I wanted originals of my own, fighting battles people rather like me would fight. 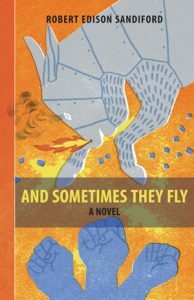 When I came to write And Sometimes They Fly about twenty years ago, it was not as a literary or fantasy novel but as a superhero comic about a group of young people who fought to save the world. At some point over the years, I decided to tell the story in prose instead, yet I, too, was still missing that sense of the epic: Who were these young people, meaning where did they come from, and whose world were they fighting to save? The tragedies of 9/11, which seemed to touch on everyone’s life everywhere on this planet, provided the necessary perspective, as metaphor for cataclysmic conflict, and moment for godlike redemptive intervention…if one so chose. Yet it was the folklore of the Caribbean, of Barbados specifically, that provided contemporary context, the proper symbols and an ongoing socio-historical discourse out of which the story could emerge. Barbados has ten national heroes, all revolutionaries, one of them—a sports icon—still living. Apart from village, community and city characters who are legend for their colour and brilliance or ingenuity, the country has a lively mythology of Anansi (a cunning, storytelling man-spider), baccous (wicked or mischievous spirits made flesh), heartman (the bloody scourge of hard-ears children who stay out too late), and djablèses (a very Caribbean kind of succubi). Heroes and villains abound in our culture. The epic in any work comes from the writer’s understanding of his (or her) people and their place in history, what we might call Time, here, even if his people are embodied in an individual or their place is no larger than a village. His people, regardless of their number, race, faith or colour, are inevitably humanity itself, or his conception of it. Events in Egypt or Syria can have magic or tragic consequences for a family or woman in Barbados or Trinidad. The epic reveals the possibilities of a grander world, one made up of the worlds we already know and of others we still struggle to explain. To imagine ourselves onto that boundless landscape, as writers and readers, is no privilege, nor should it be viewed as a burden. It is merely our right, and our responsibility.